a kind of forever present is a public talk in the form of a theatrical performance that explores what ever happened to postmodernism. 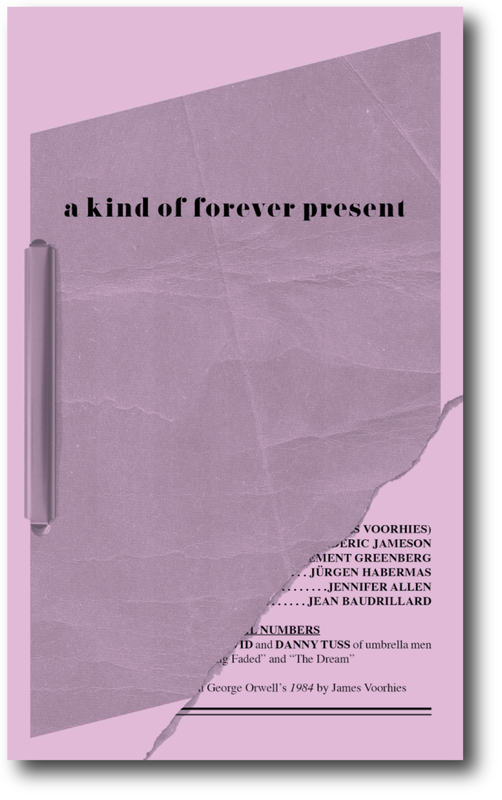 a kind of forever present culls and combines citations from texts by theorists Fredric Jameson, Jean Baudrillard, Jürgen Habermas, Clement Greenberg and others to hold a fictitious conversation about the postmodern impulse. The performance-conversation considers the decline and transformation of postmodernism into a hybrid, constant stream of social media, information capital and cultural production in the current moment. a kind of forever present is a response to an invitation by Salon für Kunstbuch 21er Haus in Vienna to talk about the function of writing and publications for Bureau for Open Culture. The performance is part of our ongoing interests in expanding forms of critical writing, the catalogue essay, design and, generally, the exhibition publication. Recent books by BOC have sought to simultaneously document, contextualize and perform ideas under investigation by the projects. a kind of forever present emerges from these interests, specifically from the book for Seventh Dream of Teenage Heaven which includes a screenplay-as-catalogue essay by James Voorhies. At Salon für Kunstbuch 21er Haus, BOC and a host of collaborators produce a kind of forever present with rudimentary theatrical tactics that break down distinctions between audience, props, characters, scripts and performers. The performance includes original musical scores by Brooklyn-based band umbrella men with lyrics drawn from George Orwell’s 1984. It is followed by a conversation between James Voorhies and Bernhard Cella of Salon für Kunstbuch. Music written and performed by Danny and David Tuss of umbrella men.